ASCAS was created three years ago. Its main objective was to offer to its members a space for publishing articles, information and photos sharing their knowledge with other members. A rate of two articles per month was maintained till June 2007, when the lack of new material allowed the publication of only one article. 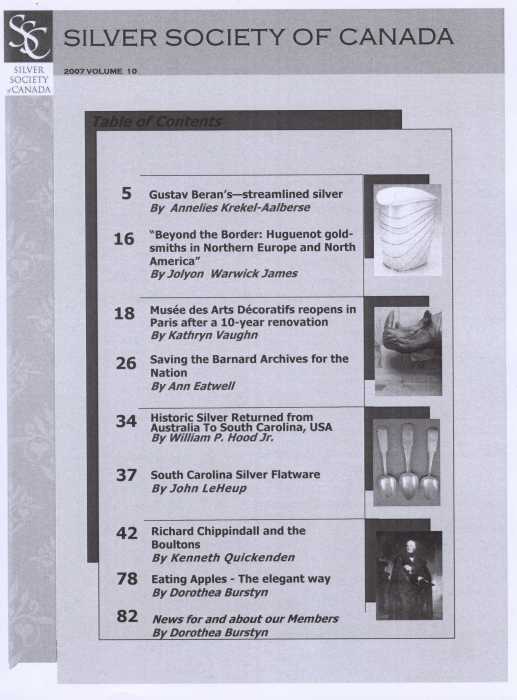 Scarcity of material repeated last month, when only Giovanni Ciceri's courtesy (with his "last minute" excellent article on Britannia Standard) allowed the publication of August Newsletter. This month no new article was supplied by members and I'll try to remedy this sad situation by publishing in the September Newsletter a reprint of one of my old articles (published long time ago in my private website and in 'Open Salt Collectors National Newsletter # 12'). But without the help of other members I'm unable to maintain the monthly frequency of ASCAS Newsletter. I regret to announce that from next month (October 2007) I'll be obliged to suspend monthly issues of the ASCAS Newsletter. I hope that this will be only a temporary suspension and I'm ready to edit new issues as soon as new articles become available. This announcement does not signify that ASCAS has ceased its activity. The ASCAS website will be maintained alive and new memberships will be accepted "with reserve" (in truthful wait to start again ASCAS activity). I hope that, with your support, this temporary difficulty will be overcome and many other ASCAS Newsletters will arrive soon in your PC. ... 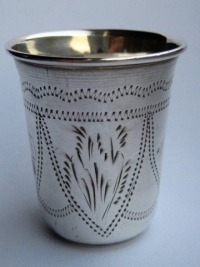 Please find attached pictures of a silver Kiddush cup. I was looking in the Russian hallmarks of the ASCAS dictionary and found 1 hallmark (KIEV silversmith IEZ nr 197 (P-L 617) which corresponds seemingly with the hallmark on the cup. Can you confirm this? 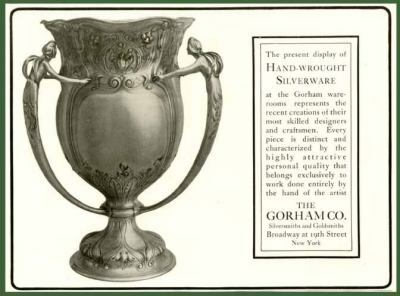 Do you have any idea about the date the cup was manufactured? 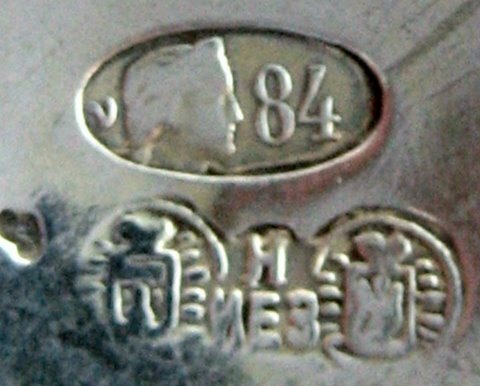 I am a real uninitiated concerning Russian hallmarks and maker's mark, so any help of your side is welcome for me. Thanks again for your taking care of my request. 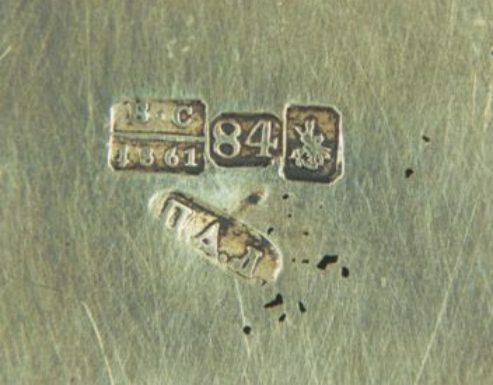 you are right: the mark is P-L # 617. 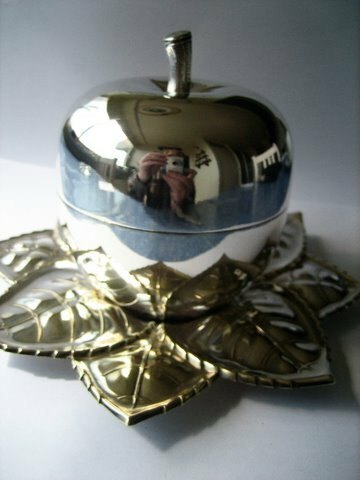 If you look on my private website at http://www.silvercollection.it/4russiansilverhallmarkB.html you'll find some other information. 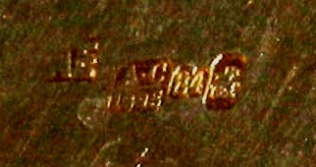 The mark 'unidentified' in P-L corresponds, possibly, to Igor Zavyandv Successors (I find this note in my files, but I don't remember where I found this information). Female head towards right is the mark of Kiev used 1908 - 1926 c.
... 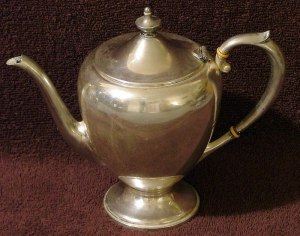 I have three pictures of a sterling teapot set I cannot determine the pattern nor the origin/time period. I have researched the matter for 6 months and cannot find anyone who can help me. Maybe you can. 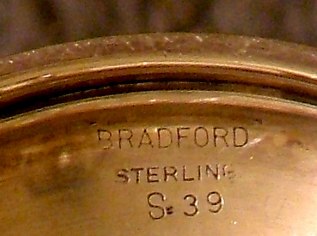 The set is marked Bradford Sterling. 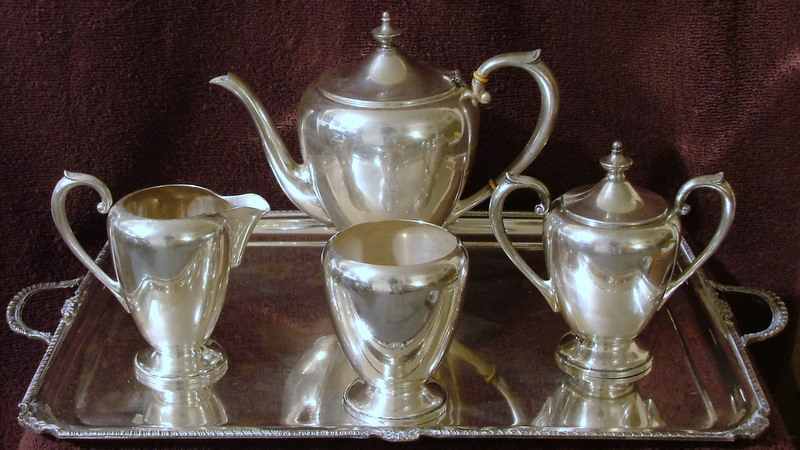 It resembles late 19th century English teapot sets I have seen although I know of no Mfg named Bradford Sterling. Please examine the photos and help me with whatever info you can come up with. ... 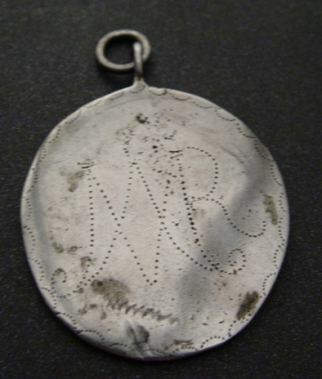 I am trying to identify the marks on the medal in the pictures enclosed. I believe it is a medaglia "ombellicale" from Sicily. Although quite honestly I don�t know how they got that name. 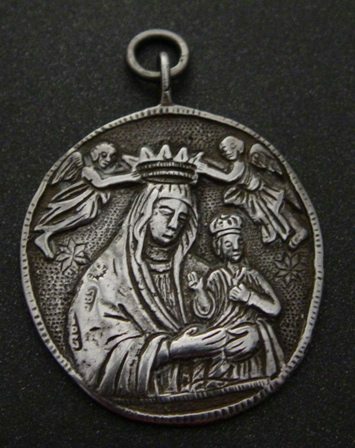 I'm unable to identify the mark of your medal nor do I know if your item is a " medaglia ombelicale". 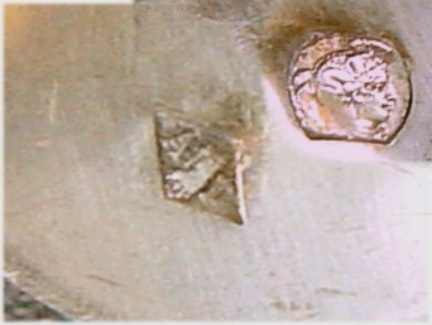 What I know is that a coin (or a medal?) was used to restrain newborns' umbilical hernia (an ancient popular remedy not approved by modern medicine). ... I was wondering if you could help me with several spoons brought back from France after WWI? They depict each of the major battles in which Canadian soldiers saw action. 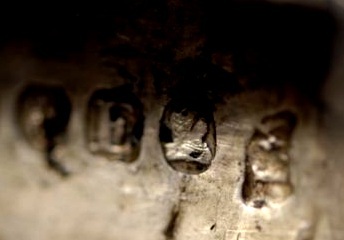 Noted is Minerva with the numeral 2 lower right field, which I assume means .800 silver. There is a diamond with A & D, with some manner of design between. The spoon pictured commemorates the battle at Lille, in block print on shield at top, and in script on spoon. 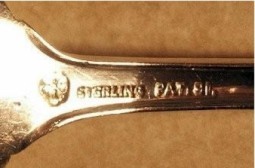 Do you have any information as to when and where these spoons were made? 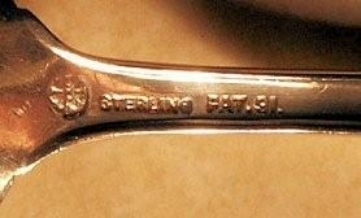 your spoon was made in France, but I'm unable to identify the maker. 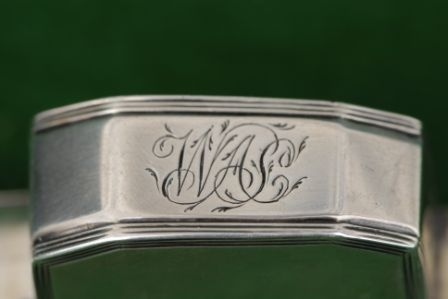 I hope that someone well acquainted with French maker's marks may reply to your question. ... my little Victorian ladle is marked GA and I'd wish to know who its maker is. the maker is George William Adams. ... 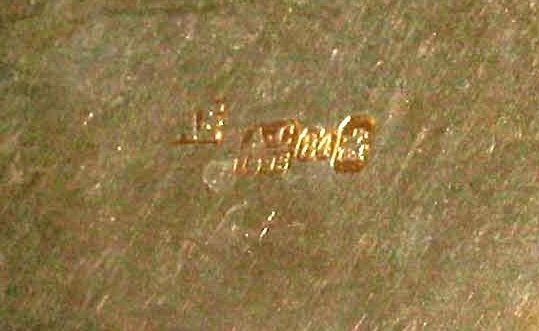 I have a silver spoon with the hallmark of what appears to be a four-leaf clover inside a circle on the back of the handle, just at the base of the handle, before the bowl. The spoon also says: "STERLING" and "PAT. 92". 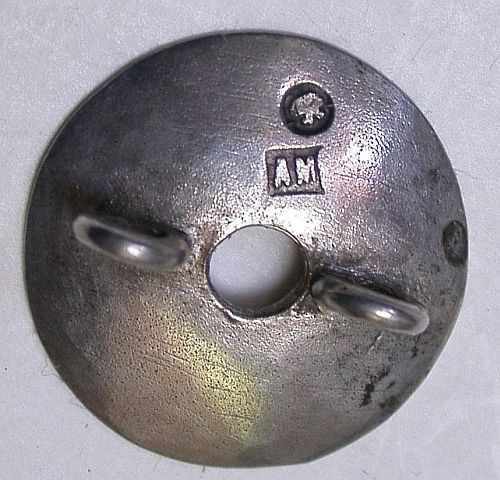 I'd need information for a possible match with what I have to find the manufacturer? ... I have a trimmer that I have identified with you beautiful internet site about England Mark. 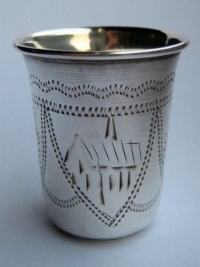 I think it's 1800 silver London work but I don't identified the maker. 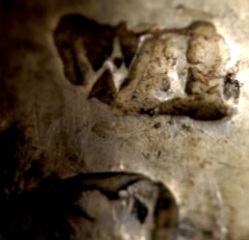 I think it is "Wb". When I will know the silversmith, how can having information about it? 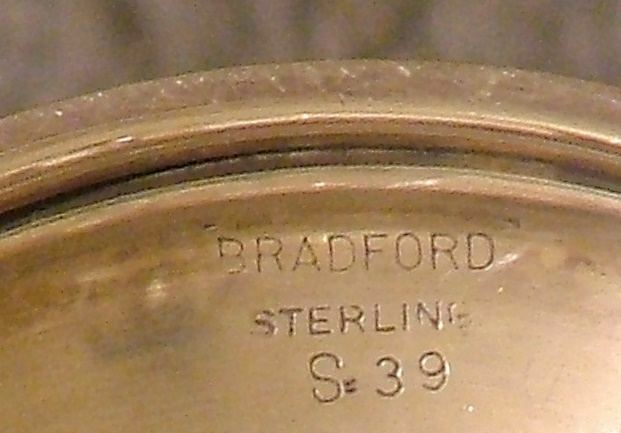 It exist also a monogram on the bowl. what is it? Do you known the signification? 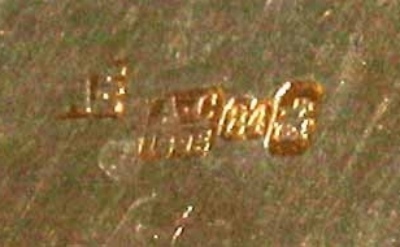 the monogram is, possibly, the initials of an owner. I'm not aware about a maker "Wb". 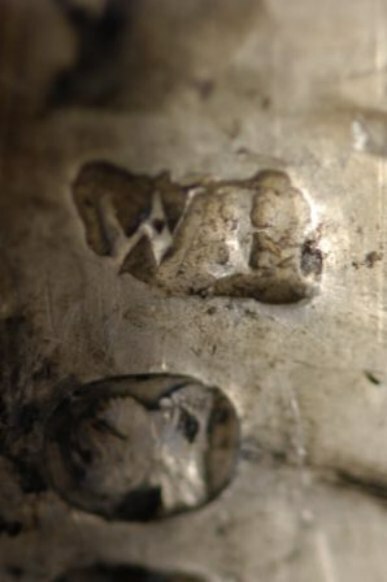 According to Jackson there was a mark "WB" belonging to Wilkes Booth, mark entered 1787. This silversmith was known as maker of snuffers. ... 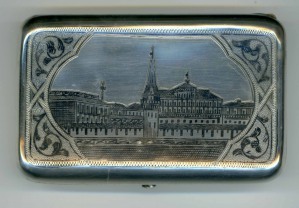 I'm sending some info on my Russian Niello Cigarette Box. 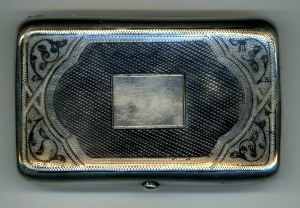 The Box Measures 2.5" X 4" X .5". It was my grandfather's and I believe he brought it with him from Europe (?) at the end of the 19thC. Slightly to the left is a series of three boxes each a square with clipped corners. 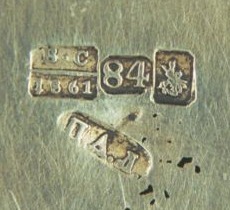 The left most box says AC over a line that says 1895 - the middle box says 84 with upper and lower - in-between the 8 and the 4 - the far right box has a stamped mark of a helmeted figure on a horse, carrying a spear. 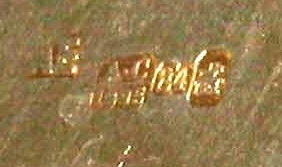 The background around the marks in the squares is brass in color. 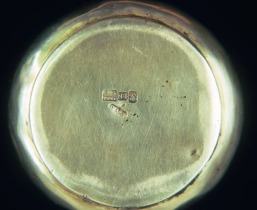 Top Lid the AE is there in a square and there is a separate mark of an 84 and the horse/rider sign in a fused set of two circles. 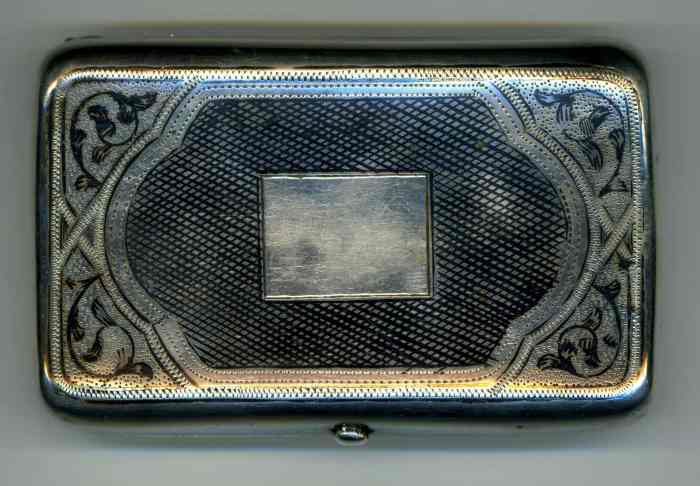 Your cigarette case is Russian, made in Moskow (St.George on horse), but I'm unable to find neither the assayer (AC) nor the maker AE Posnikova-Loseva book. ...I've another puzzle. A week ago, I picked up a set of 12 charger plates (10.5 inches across) with a full hallmark that reads GAB - Touch mark of a two handled urn in an oval - NS ALP on the front of each plate. 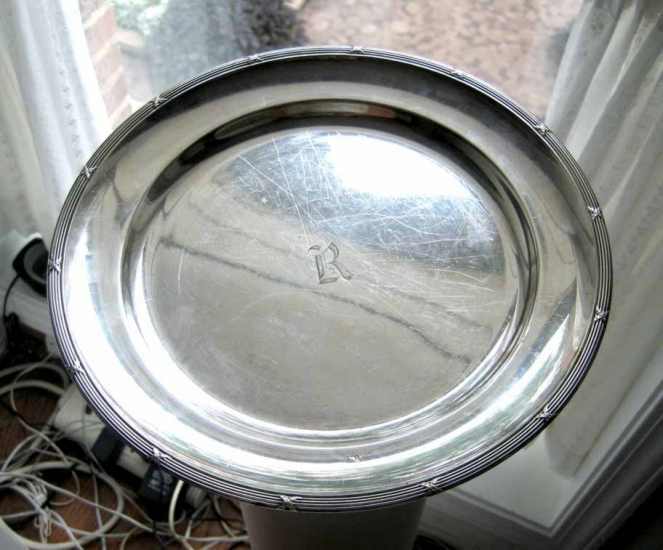 I believe them to be silver (plate?) and Swedish. Picture is enclosed. 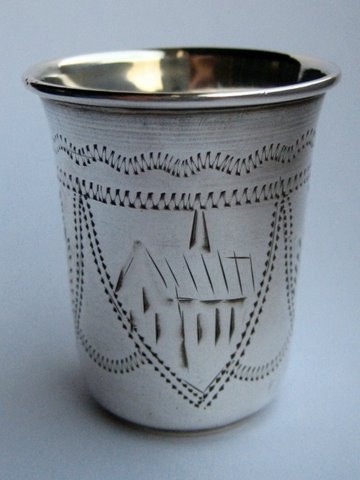 Any help with Manufacturer, pattern, silver content, and/or value would be most helpful. I've no information about maker GAB. I believe that the meaning of NS ALP is NICKEL SILVER ALPACCA. 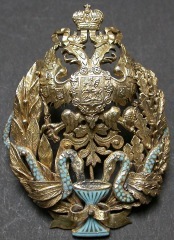 .... Moscow marks, 1891-96, gilded and turquoise (?) 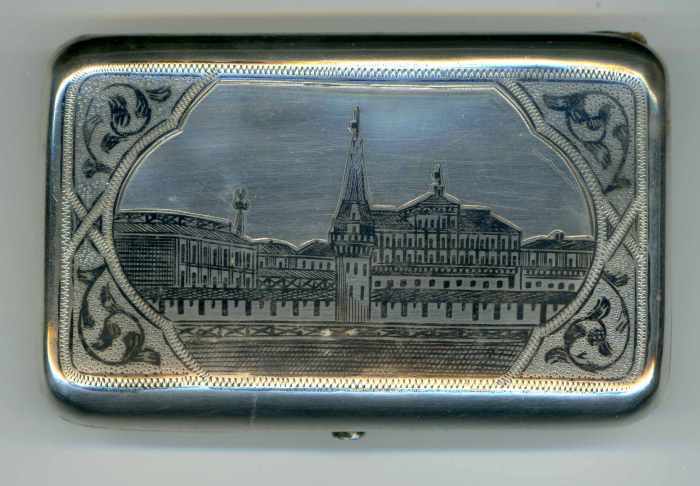 enamel on silver, could it be Aleksandr Mukhin (active 19th Century)? But also there are other late 19th Century makers with AM who haven't been traced. 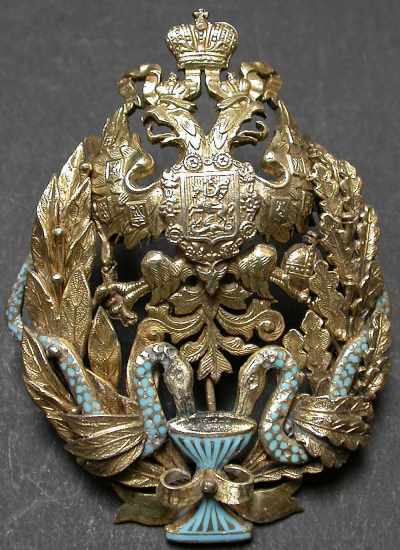 Seems to be a relatively common badge/award, and not necessarily regimental. 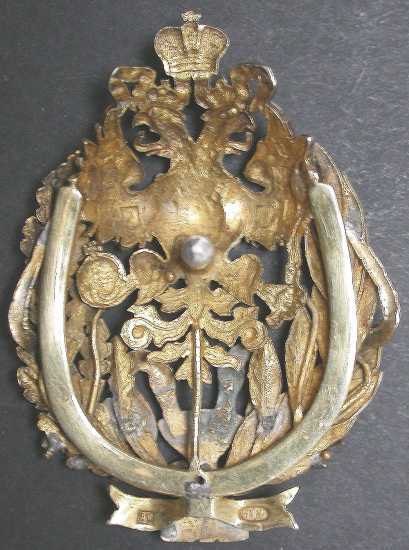 Similar Tsarist awards to graduates of Academic and other Institutions. 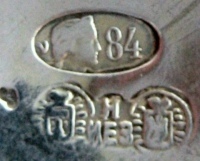 All have the double headed eagle, and central badge on eagle's chest, and small badges scattered to left and right of eagle's chest. The use of the Laurel Leaves would strongly suggest an Academic (merit) award. ... The maker was correctly identified in Geoffrey Watts - Russian Silversmiths' Hallmarks as Pyetr Lobanov (1861 - 1883) working in Moscow. 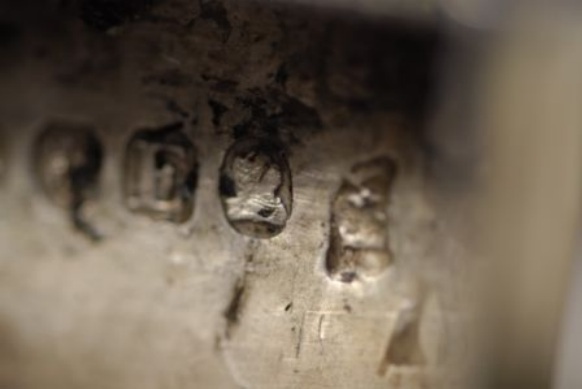 Also Adam Goldsmith identified the mark as "Petr Lobanov (Postnikova Loseva mark no. 2782)" . I misunderstood the mark in Crystal's photo. It is PAL and not DAI. 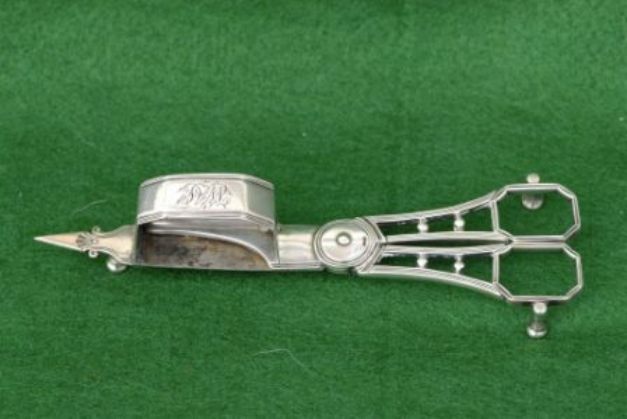 Date 1861-1883 is the period of activity of this silversmith and the date is on line with the 1861 date of assaying. This month ASCAS presents a 1903 leaflet by Gorham Co., Silversmiths and Goldsmiths, Broadway at 19th Street, New York advertising " HAND-WROUGHT SILVERWARE" representing the " the recent creations of their most skilled designers and craftsmen "
The Silver Society of Canada published its JOURNAL 2007, Volume 10. This edition of the Journal is a 92 pages magazine with many intersting articles and informatiom. Click on the photo for a larger image of its content. 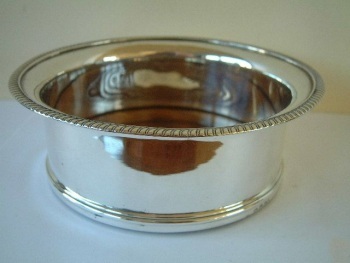 coaster is a type of dinner table accessory, usually circular, that was used to protect the surface of the dinner table from being scratched by the bottom of wine-bottles. Closing our SEPTEMBER 2007 edition of ASCAS Newsletter I hope you have appreciated its content. My thanks to Alessandro Colemann (Italy), Jayne Dye (USA), Michael Friedman (USA), Hosea Jones (USA), Robert Massart (Belgium), Maurice R. Meslans (Belgium), Wendy Posner (USA), Jean-Luc Stas (France), Gordon Tibbles (Canada) for their invaluable contributions.